Movie Review: It had been a while since one of these virulent Korean thrillers didn’t hold my attention. To be more precise, the last one was “Snowpiercer”, a Bong Joon-ho’s creation, released more than a year ago. 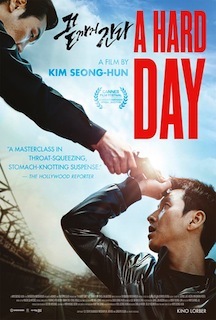 Even considerably distant from the riveting action movie cited above, the brand new “A Hard Day”, the sophomore directorial feature from Kim Seong-hoon, was thought with logic and cooked with enough energy and intensiveness to solidly entertaining me during the toughest day in the life of Western District homicide detective, Ko Gun-su (Lee Sun-kyun). After a tiresome day, where he and his colleagues were subjected to a meticulous investigation for bribery, detective Ko drives in the middle of the night in order to meet his sister and little daughter for the final burial of his mother whose funeral happened hours before. However, tragedy occurs and he accidentally runs over a man who was standing on the side of the dark street. In panic, and under the pressure of a patrol police car that was checking the area, he hides the dead body in the trunk. After being stopped at a DUI checkpoint, which was the funniest scene in the film, he couldn’t find any better solution than dump the body inside his mother’s coffin. From then on, he starts receiving threatening phone calls from an abusive corrupt cop, Lt. Park (Jo Jin-woong), who inexplicably demands that he brings the body of the victim that after all was wanted for murder. Most of the plot’s twists had a successful impact while just a few ones are guessable, fact overturned by the director’s efforts in bringing in exciting physical confrontations and chases. In truth, the scenes of violence are firm and ferocious, but never uncontrolled or overdone. If you dig cat-and-mouse thrillers, this is a good choice since Mr. Seong-hoon found a positive equilibrium between a thrilling script and tight action.